Netherlands international Steven Bergwijn is a target for the Reds according to reports in his homeland. 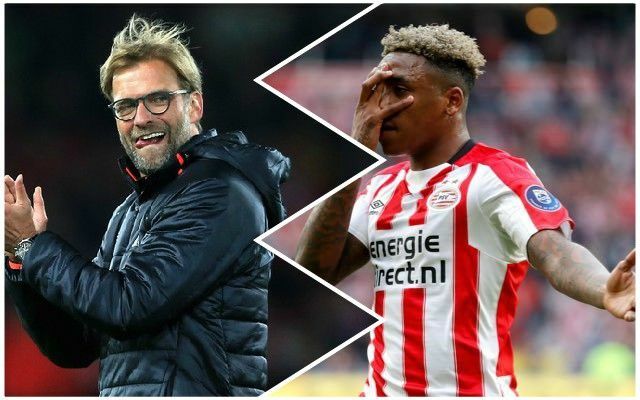 De Telegraaf, via the Daily Mirror, say Jurgen Klopp is very interested in the 21-year-old, who has played 25 times for his current side PSV this season. The reported price-tag is around £26 million, though any bid would not come this month, but in the summer. Bergwijn has scored 10 goals this campaign and has provided nine assists in all competitions, which is impressive from a wide position. The Reds could do with another wide forward with little cover for Sadio Mane, but whether Bergwijn would want to come in and play a squad role at a crucial moment in his career remains to be seen. There is also the future of Harry Wilson to consider when he returns from Derby County. It will certainly be interesting to see who the club targets in the summer transfer window. With players like Daniel Sturridge and Alberto Moreno coming to the end of their contracts, there could be quite a few moves. Whether Bergwijn is someone of interest remains to be seen, but he does look to have the profile that the Reds might be interested in as a young attacker with a good level of end product.